Bored of the regular nachos? Filling always falls off the tortilla? Try out the best spoon nachos in the world! Awesome filling made with beef mince, chili peppers, red onion, DorBlue cheese and avocado, everything under the homemade soured milk! A new way for nachos flavors! Mix 1 hand of the flour along with ½ hand of water and 1 tsp. of salt. Mix and knead well! Form a ball. Preheat the pan, melt 3-4 tbsp. of mangalica lard in it. Flatten out the dough, divide into squares. Attenuate and flatten out each dough square. Dip-fry dough triangles until crispy golden brown. Toss 400g of beef mince into the pan. Chop handful of spring onions. Toss into the pan. Add 1 tbsp. 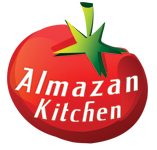 of AlmazanKitchen® Nacho Spice Mix. Mix and stir everything well. Slice few chili peppers. Toss into the pan. Stir fry everything for a while. Scoop out the seed, and remove the skin from avocado, then dice it. Add 20-30g of DorBlue cheese to the pan, stir well, let it melt. Finish off the filling with 1 cup of soured milk, avocado dices, onion and some more chili. Do not forget to use the spoon tortillas!